Who knew you could have creamed anything without dairy? Thanks to rice milk, it works out great! I just use the recipe for a simple white sauce and gussy it up a bit. Use cooked sausage for biscuits and gravy for breakfast. Or try chopped hard-boiled eggs and serve over steamed asparagus and toast for a yummy spring meal. To make the biscuits, I just use an MSPI-friendly biscuit mix (Great Value brand from Wal-Mart is safe) and follow the directions on the box, substituting rice milk for the milk. Melt butter over medium heat in large skillet. Whisk in flour until smooth. Stir for one to two minutes, until mixture begins to slightly bubble. Whisk in half of the rice milk, stirring continuously to avoid lumps. Once it begins to thicken, stir in the ham and veggies. Stir in more rice milk as sauce continues to thicken, adjusting the amount depending on how thick you like your gravy. Add salt and pepper to taste. Serve over hot biscuits. I love my slow cooker! When you have little ones under foot, it's so much easier sometimes to fix dinner in the morning, when you have more time, and let it cook all day. Here's a great soup recipe from the "Fix-It and Forget-It Cookbook." Wash and sort split peas, removing any stones. Then combine ingredients in slow cooker. Cover. Cook on low 8-10 hours. Remove ham bone. Cut meat off and dice. Return meat to soup. Stir through. Remove bay leaf before serving. *** I like to use two ham hocks, in order to have more meat. Also, I use a 1/4 teaspoon ground allspice, instead of the whole allspice. I made this strata last night, baked it this morning and took it to a mom's group that I attend at church. It was a hit! The cheese that's usually a mainstay in strata recipes wasn't even missed! The inspiration for this recipe came from the "MSPI Guidebook/Cookbook," but I changed things up a bit. The great thing about stratas is that you can put just about any veggie you have on hand in it. Clean out the fridge! And the bulk of the work is done the night before! In a large skillet, saute sausage, onions and mushrooms. When sausage is about halfway cooked, add spinach and nutmeg to skillet. When sausage mixture is completely cooked, season to taste with salt and pepper and remove from heat to cool. In a medium bowl, whisk together eggs, rice milk and seasoning salt. Coat a 9x13 baking dish with cooking spray. Mix together bread cubes and cooled sausage mixture in baking dish. Pour egg mixture over the top, evenly coating the bread. Cover the dish and place in refrigerator overnight. In the morning, heat oven to 350 degrees. Place uncovered baking dish in oven for 50-60 minutes until top is golden brown. I was asked about a pancake recipe that's MSPI-friendly. This should work! Source: Adapted from "Betty Crocker's New Cookbook"
Beat eggs in a medium bowl with a hand beater until fluffy. Beat in remaining ingredients just until smooth. Heat griddle or skillet over medium heat or to 375 degrees. Grease griddle with oil, cooking spray or MSPI-friendly margarine. For each pancake, pour slightly less than 1/4 cup batter from cup or pitcher onto hot griddle. Cook pancake until puffed and dry around edges. Turn and cook other side until golden brown. Serve with MSPI-friendly margarine and syrup. I haven't made this recipe from Taste of Home but thought it would be a nice change from normal potato salads that are packed with mayonnaise. The recipe makes only two servings, so double or triple it as necessary for your family. Make sure you use real bacon bits -- artificial bacon bits are usually made from soy. Libby and I made this recipe from Crisco yesterday. They weren't nearly as chewy as I would have liked, but they sure tasted good! I've been using Ghirardelli Semi Sweet Chocolate Chips without JD having any reactions, and Enjoy Life makes a chip that is free of dairy, soy and gluten. This recipe from Kraft Foods is a great option when it's 5 o'clock and you still have no clue what you're going to make for dinner. We almost always have all these fixings on hand. Just serve the cheese on the side for those in your family who can eat it and make sure the taco seasoning mix you use is MSPI-friendly -- I use Ortega. Also, stretch your family's food budget by adding a can of corn and/or black beans. The leftovers can be used to make enchiladas or burritos. 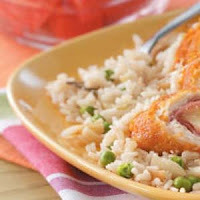 This dish was inspired by Giada De Laurentiis' Peas and Prosciutto recipe. By adding pasta and ham, I turned this simple side dish into a full-fledged meal that's perfect for spring! Saute the bacon in a large skillet over medium heat. Remove bacon from pan and drain on paper towels. Remove all but 1-2 tablespoons of bacon grease from pan, and return pan to heat. Add the shallots, garlic, salt, and pepper, and saute over medium-low heat until tender, about 1 minute. Add the peas and ham and saute until heated through, about 5 minutes. Stir in the pasta, bacon and reserved cooking water and cook for 1 to 2 minutes. Add the parsley and remove from the heat. Season, to taste, with salt and pepper and serve. *** Don't have shallots? Substitute a small onion. Also, boost the health factor by using whole wheat pasta. I was just cutting up some cheese for Libby's afternoon snack. I was salivating over a silly hunk of colby! How sad is that!?! Not to mention I wanted to dive into the vat of creamed corn on the Easter buffet yesterday at my cousin's restaurant! Let's face it. You can find decent substitutes for some dairy products but cheese isn't one of them! Here's a yummy-looking vegetarian option from Swanson. If you want meat in it, add some cooked and shredded chicken or cook up some Italian sausage. Do you have a million hard-boiled eggs to use up after the Easter Bunny dropped by this weekend? One of my favorite ways to eat them is Deviled Eggs. This simple recipe comes from the "Betty Crocker New Cookbook." Cut eggs lengthwise in half. Slip out yolks and mash with fork. Stir in mayonnaise, mustard, salt and pepper. Fill whites with egg yolk mixture, heaping it lightly. Cover and refrigerate up to 24 hours. *** Sometimes I add a little bit of sugar to the yolk mixture, and I like to sprinkle the tops of the eggs with paprika as a garnish. I haven't made this recipe from Taste of Home, but it looks yummy and is low in fat and egg-free! Just make sure you use MSPI-friendly chocolate chips like Ghirardelli Semi Sweet. I took the kiddos down to visit my grandparents yesterday. They've been married 65 years, isn't that incredible!!! While there, my grandma served this yummy salad for lunch. The original recipe calls for soy sauce, but she substituted salt. Also, make sure your mayo is MSPI-friendly. I have yet to run into one that isn't, but you never know! Combine chicken, water chestnuts, grapes, celery and half the almonds. Mix all remaining ingredients, except for lettuce and remaining almonds, and add dressing to chicken mixture. Chill several hours, serve on lettuce and sprinkle with remaining almonds. A gal on the MSPI message board that I follow recommended the website Food Allergy Kitchen. They have a fantastic list of substitutions for dairy products in baked goods. JD had his 2-month well-check yesterday, and one thing is for sure: MSPI isn't slowing him down. He has gained 6 ... that's right SIX!!! ... pounds since he was born and grown nearly 3 inches! He currently weighs 13 pounds, 10 ounces. No wonder my arm feels like it's going to fall off when I lug him around in his car seat! On a more serious note, his weight gain is proof I'm on the right track with my diet. Ten more months to go! 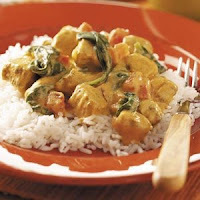 I'm planning to make this recipe from Campbells for dinner tonight. Some of the reviews on the website recommend adding salt and garlic, which I will likely do, too! Dream? More like a nightmare! I read a while back a tip from another mom on an MSPI message board that Rice Dream refrigerated rice milk is cross-contaminated with dairy. I didn't worry about it at the time, even though that's the product I use. I figured JD would let me know if it bothered him. Well, he let me know! I usually only have a large amount of rice milk when I have cereal, and I hadn't eaten cereal in quite a while. I had oatmeal with rice milk for breakfast yesterday morning, and JD spent the rest of the day spitting up and fussing! Evidently Rice Dream's shelf-stable rice milk isn't cross-contaminated, so it should be OK. Of course, I can only get the shelf-stable product at stores with health food sections, whereas the refrigerated rice milk was available at Super WalMart. Not nearly as convenient! Oh well, that's the price we pay to keep our babies healthy and happy! Now what do I do with that half-gallon of rice milk in my fridge? Here's a recipe from Cook's Illustrated that I couldn't resist. It's baking in my oven as I type this blog entry! Just one change makes it MSPI-friendly. A note about margarine: I'm fortunate enough to have been able to locate an MSPI-friendly stick margarine (Fleischmann's Unsalted) that's perfect for baking. But not everyone is so lucky. Try talking to your grocery store about special ordering a case for you and throw it in your freezer. You could also try substituting shortening, but I believe when baking with shortening, you want to use a little bit less shortening than margarine or butter. Just experiment! Adjust an oven rack to the middle position and heat the oven to 325 degrees. Lightly coat an 8-inch-square cake pan with vegetable oil spray. Whisk the flour, baking powder, spices, and salt together in a large bowl and set aside. Beat the brown sugar and butter together in a large bowl with an electric mixer on medium speed until light and fluffy, 3 to 6 minutes. Beat in the eggs, one at a time, until incorporated, scraping down the bowl and beaters as needed. Beat in the applesauce and lemon zest. Whisk the flour mixture into the egg mixture until no streaks of flour remain. Stir in the apples and raisins (if using). Pour the batter into the prepared pan and smooth the top. Bake until a wooden skewer inserted into the center of the cake comes out with a few crumbs attached, 1 hour to 1 hour and 15 minutes, rotating the pan halfway through baking. Let the cake cool in the pan on a wire rack, about 2 hours, before serving. To Make Ahead: After the cake has cooled, it can be wrapped tightly in plastic wrap and kept at room temperature for up to 3 days. Tina passed this recipe on to me. It's from Simple & Delicious magazine. Looks yummy! Cook rice according to package directions. Meanwhile, sprinkle the chicken with curry, salt and pepper. 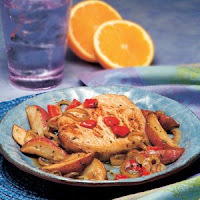 In a large skillet, saute chicken and onion in oil until chicken is no longer pink. Stir in the coconut milk and tomato paste. Bring to a boil. Reduce heat; simmer, uncovered, for 5 minutes or until thickened. Add spinach and tomato; cook 2-3 minutes longer or until spinach is wilted. Serve with rice. Yield: 4 servings. *** Update: I made this recipe on March 19th, and it was so good that I literally wanted to lick my plate! You have to try this one! Got leftover salmon? Here's a great way to use it up. Canned salmon also works well. The recipe comes from my mom. Mix together all ingredients, starting with 1/2 cup cracker crumbs and adding more until you reach a sticky but not gloppy consistency that holds together well. Divide mixture into four and shape into balls. Flatten balls until 1-inch thick. Dredge cakes in any extra cracker crumbs. Heat 3 tablespoons olive oil in saute pan over medium heat. Fry cakes, flipping after first side turns golden brown. Serve with lemon juice or tartar sauce. *** The cakes will hold up better during the cooking process if you refrigerate them for an hour prior to cooking. You've probably realized by now that my family eats a lot of meat-and-potato-meals. A big reason for that is that it's been soooo cold here in Omaha! But now that it's starting to show signs of Spring around here, things should be lightening up meal-wise. In the meantime, here's a recipe for a tasty stew. The original recipe came from Taste of Home, but I made a few changes for MSPI and my own tastes. I like it because I almost always have all the ingredients on hand, so there's little planning-ahead necessary. In a large saucepan, cook beef and onion over medium heat until the meat is no longer pink; drain. Add the stock, potatoes, carrots, tomatoes, salt and pepper; bring to a boil. Reduce heat; simmer, uncovered, for 20-25 minutes or until vegetables are tender. Whisk together corn starch and water in a small dish and stir into saucepan until stew is slightly thickened. Add mushrooms and peas; simmer 5 minutes longer. Yield: 6-8 servings. Fish may seem intimidating if you've never prepared it before, but it's actually quite easy. Here's a simple way to prepare salmon that is easily adjusted depending on how much you need to cook. Blot salmon dry with paper towels. Coat baking sheet with non-stick cooking spray and place salmon on sheet, skin side down. Drizzle olive oil over salmon fillets and use fingers to help spread the oil so it evenly coats the fish. Sprinkle fish with spices and lemon juice. Place baking sheet in 425-degree oven. Depending on thickness of fish, it will take 10-15 minutes for fish to cook. Check after 10 minutes, just use a fork to peek between the flakes of the salmon. You want to pull the fish out while it's still slightly opaque; it will continue to cook once out of the oven. I haven't made this Better Homes and Gardens recipe, but I sure think it looks yummy! Preheat oven to 350 degrees F. Wrap tortillas in foil and heat in oven. Meanwhile, coat a 12-inch nonstick skillet with cooking spray; heat over medium-high. Add pineapple slices; cook 4 to 6 minutes, until browned, turning once. Remove. 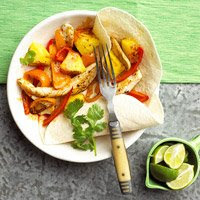 Cut chicken in strips; toss with sweet peppers; jerk seasoning, and pepper. Heat oil in skillet; add chicken and peppers. Cook and stir over medium-high 4 to 6 minutes, until chicken is no longer pink. Core and chop pineapple. Serve with chicken, tortillas, cilantro, and lime. Makes 4 servings. There's a reason I cook so much ... it's too hard to eat out on this diet! We went out for breakfast this morning. I figured breakfast would be easy to avoid dairy. Bacon, eggs, white toast ... how hard could it be? Well, I messed up. I ordered my eggs scrambled. I make scrambled eggs with nothing but eggs, but I'm guessing the restaurant added milk or cream because JD wasn't a happy boy this afternoon. Oh well, next time I'll order my eggs over-easy! Don't let the "spicy" adjective scare you away from this tasty soup. It's not "spicy" hot, just flavorful. The recipe is slightly adapted from "The Moosewood Cookbook." Heat olive oil (and butter) in pot. Add onion, garlic, salt, dill and pepper. Stir over medium heat for about 5 to 8 minutes until onions are translucent. Add canned tomatoes, water and honey. Cover and simmer over low heat for 20-30 minutes. About 5 minutes before serving, stir in tomatoes. The secret to a knock-your-socks-off salad is the dressing. When you want to impress someone, always make the dressing from scratch! Here's a simple dressing recipe from "Barefoot Contessa Family Style." I couldn't find champagne vinegar, but white wine vinegar worked great, too! And don't hesitate to leave the egg yolk out; the dressing still tastes yummy without it! 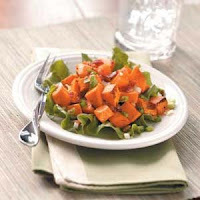 Here's a nice little side dish recipe from Taste of Home. Just substitute olive oil for the butter. My in-laws were in town this weekend, and I went into cooking mode -- I don't get to cook for them very often, so when they visit, I pull out all the stops! I made this salad and served it with soup and sandwiches. The recipe comes from the Food Network show "Everyday Italian." I made a few changes to the original. I served the cheese on the side so that everyone else could enjoy it. And since it isn't summer and fresh basil is ridiculously expensive, I used about a cup of fresh flat leaf parsley in the dressing and added a teaspoon of dry basil. I also added a can of artichokes because they're so yummy! My super-duper friend Tina made this for our family when I first started taking dairy out of my diet. Her baby girl is MPI, and Tina's gone without dairy for several months. She's a pro at cooking up some dairy-free meals. By the way, Tina made our pie with ... ELK! And it was sooooo yummy! Her husband hunts a ton, but most of us don't have elk on hand. Ground beef works well, too! Mix all vegetables and meat with oil and spices, such as garlic powder, basil, thyme and ground mustard. Pour into the dish and top with crust. Cut slits in crust and bake at 400 for 45-60 minutes. We like to eat this dipped in mustard. Combine first 4 ingredients until crumbly. Add water and mix until dough forms into a ball. Do not add more water or you will end up with a sticky mess. Roll out to desired size on a floured surface. *** Tina doesn't measure anything except for the crust ingredients. She just seasons the veg/meat til she thinks it looks good. She makes this in an 8x8 dish because it seems to be a good amount for her family. Plus, the crust is a little thicker then and so yummy! We had tacos for dinner last night. Not very exciting, especially when you can't pile on the cheese or sour cream! So I splurged and had some guacamole. Many store-bought guacamoles aren't MSPI-friendly, so you'll have to make it yourself. But don't worry, it's easy! To make an easy guacamole, just mash one ripe avacado, sprinke it with lemon juice, mix in 1 to 2 tablespoons salsa and add a pinch of salt. Adjust amounts to your taste. You can easily double or triple the recipe depending on how much guacamole you need. Ole! Another winner from Laura! Just a few tweaks to make it MSPI-friendly. The original recipe comes from Allrecipes. In a medium bowl, cream together the 1/2 cup of margarie or shortening (butter) and white sugar. Add pumpkin, egg, and 1 teaspoon vanilla to butter mixture, and beat until creamy. Mix in dry ingredients. Drop on cookie sheet by tablespoonfuls; flatten slightly. To Make Glaze: Combine confectioners' sugar, juice (milk), 1 tablespoon melted margarine or oil (melted butter), and 1 teaspoon vanilla. Add liquid as needed, to achieve drizzling consistency. Here's another recipe from Laura. No substitutions needed! Preheat oven to 350 degrees. Combine dry ingredients. Add remaining ingredients. Beat until smooth. Pour into two ungreased 9-inch cake pans. Bake 30-35 minutes. Cool on rack. Frost with desired frosting. *** One-half of this recipe makes 12 cupcakes. This recipe is my absolute favorite cake, and it's MSPI-friendly! It's so rich and moist. My mom made it for many of my birthdays as a kid and now I'm going to make it for my hubby's birthday this week. I had to make a few changes to the icing to make it OK for me to eat. Mix all ingredients until batter is smooth. Bake in greased and floured 9x13 pan at 350 for 35 minutes. Combine ingredients adding small amounts of milk or powdered sugar as needed. Beat until icing is smooth and fluffy. Quick Start with MSPI Mama: This is one of my Quick Start recipes, as long as you don't use the icing. Instead, try a sprinkling of powdered sugar once the cake has completely cooled. I made this recipe from Taste of Home for dinner. The meat is incredibly tender! There's some changes I made to make it easier and vegetable-packed. First, I didn't bother with sauteing the onions. I just tossed them in with the potatoes. (If you do this, use only two tablespoons of oil instead of four.) Also, I used two white potatoes, one sweet potato and carrots. The sweet potatoes lended a nice sweetness to the whole pie and ups the healthy factor. And save time and energy by using a premade crust. Just make sure it's MSPI-friendly! If you do decide to make a crust, Crisco's recipe is superb. It can be a nightmare to find MSPI-friendly wheat bread. Sure, you can buy white bread, but where's the nutritional value in that? So, you either buy bread from a specialty bakery, which can be pretty expensive, or you can make it. If you've never made bread before, kneading can be rather intimidating. Here's a recipe I found that doesn't require kneading, and it's yummy! It is VERY dense, but that's likely due to the fact it's made with whole wheat flour. You could probably lighten the texture by using half whole wheat flour with half all-purpose. The recipe comes from a vegan website. Happy baking!